Every time we fit something back on LMS Third Open 7828 at Rowsley she looks better, she gets a bit heavier, and there is less ‘stuff’ to trip over. The roof ‘furniture’ is a case in point with the torpedo ventilators being very heavy, and they have now been joined by the tank vents (an inverted ‘J’) and the tank fillers, which means final painting of the roof isn’t far off. A bit lower down the Stone’s ventilators have been fitted, you can see how they work in the photograph – passengers can vary the angle of the ‘vanes’ to extract air or blast it in depending on how they feel. You can also see another important process beginning, the beading. 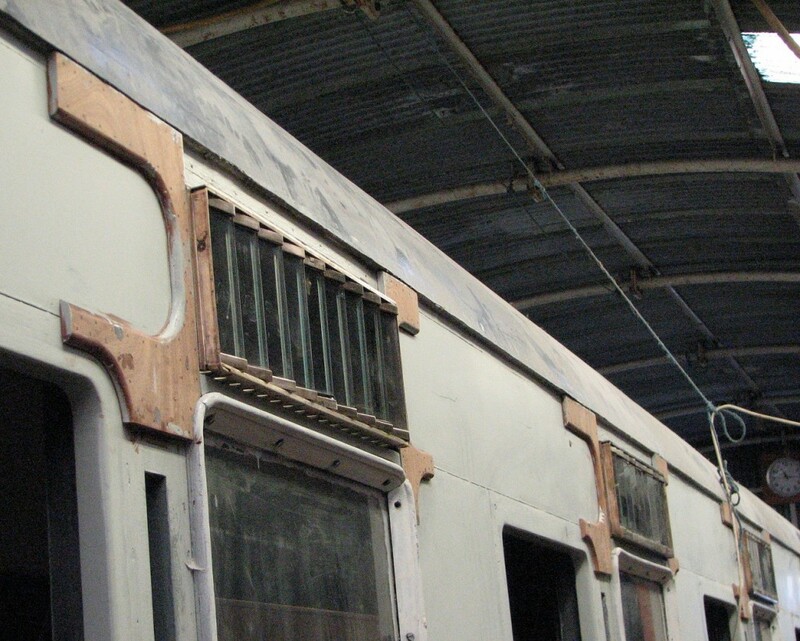 This has a real purpose in covering up the joins between the various panels on the bodyside, but is also a very attractive visual aspect of older coaches. The beading is painted up to undercoat on the back, pre-drilled for the many panel pins needed to attach it, and finally mastic sealant is applied to ensure it is weatherproof.